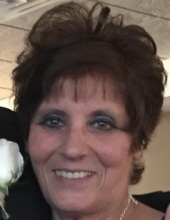 Lena J. Citriniti, a longtime member of the Middletown community, died suddenly on Monday, January 28, 2019 at Westchester Medical Center with her loving family at her side. She was 69. The daughter of the late Saverio Lavergata and Mary Loscalzo, she was born on April 7, 1949 in the Bronx. Lena was raised in the Bronx and was a lifetime Yankees fan. She was a strong mother who put family and friends before herself. She was a great cook and fed everyone, telling them to “eat, eat!”. Lena loved her grandchildren and was proud of each of their accomplishments. She enjoyed going out to dinner and cruises and liked to sing Karaoke and was an avid BINGO player. She was happy to find love and friendship again with Lenny. She is survived by her three children, Rosanna at home, Saverio “Sam” Citriniti and his wife Christine and Dominick Citriniti and his wife Gwen all of Middletown; her loving companion, Leonard Rosenblum; sisters, RoseMarie Lavergata of Covington, PA and Lena’s twin, Anna Pisanti and her husband George of the Bronx; Lenny’s children: Gloria Moyse and her husband Perry of Greenville, NY, Scott Rosenblum and his wife Annie of Pine Bush, NY and Daniel Rosenblum and his girlfriend Felicia Cicero of Bloomingburg, NY. Lena is also survived by her five beloved grandchildren, Savino, Matteo, Nikko, Michael,and Abrianna; former husband Rosario Citriniti as well as many nieces and nephews. Visitation will be from 2 to 4 and 7 to 9 pm on Thursday, January 31, 2019 at Applebee-McPhillips Funeral Home, Inc, 130 Highland Avenue, Middletown, NY 10940. A Mass of Christian Burial will be celebrated at 11 am on Friday, February 1, 2019 at St. Joseph’s Church, 149 Cottage Street, Middletown, NY 10940. Burial will follow in the family plot in St. Joseph’s Cemetery in Middletown. To send flowers or a remembrance gift to the family of Lena J. Citriniti, please visit our Tribute Store. "Email Address" would like to share the life celebration of Lena J. Citriniti. Click on the "link" to go to share a favorite memory or leave a condolence message for the family.